On Monday 18th March, Year 5 and 6 participated in workshops provided by the NSPCC. During these events, the children engaged in mature discussions about a range of topics and expressed how they would react in certain situations. Before beginning the workshops, the children remembered Buddy, the NSPCC mascot, and could explain that he is a speech bubble because he reminds us to ‘Speak out. Stay Safe’. They were also able to recite ChildLine’s telephone number. Throughout the workshop, the children recapped on the different forms of abuse and were then presented with different scenarios. 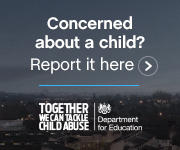 When discussing the different scenarios, the children identified the different types of abuse and identified where they could go for support and who they could ask for help. Additionally, they discussed a range of situations and whether certain actions or events would be ‘sometimes’, ‘always’ or ‘never’ acceptable. When can you contact ChildLine? Anytime. ChildLine is open all day, every day. How much does it cost to contact ChildLine? Nothing. It is free to get in touch. What rights do all children have? To speak out and be heard. To get help when they need it. Everyone enjoyed asking and answering the questions. We would all like to thank the NSPCC for providing an informative, engaging and thought-provoking workshop.